The sunlight which reaches the earth, while it can feel extremely hot, does not contain sufficient energy in the diffuse form in which it arrives to constitute the basis for a thermal power generation system. In order to make it useful, the sunlight from a large area must be concentrated. This can be achieved with a magnifying lens but lenses form a relatively expensive way of concentrating sunlight. Much better is a concentrating reflector. The parabola is the ideal shape for a solar reflector because it concentrates all the light incident on it from the sun at a single point called the focus. A complete parabola is circular; this forms the basis for solar dish system (see below). However there is a limit to the size of dish which can be built. For large-scale solar concentration, a trough-shaped reflector has proved more effective. If the trough is built with a parabolic cross-section, the reflector will bring the incident sunlight to focus at a line rather than at a single point, a line running along the length of the trough. This is the basis for the solar trough. The reflecting panels in a solar trough are made from mirrored glass, although cheaper options are also being developed. These reflecting panels are mounted on a substantial substructure capable of supporting their weight. Along the length of each trough, mounted exactly at the focus of the parabolic cross-section, is a heat absorbing tube. This is where the solar heat is collected. An individual solar trough reflector may be up to 150 m in length. Arrays of parallel troughs provide the required collection and generating capacity. A large number or troughs will be required to build a utility-sized power station. For example, a single 30 MW power plant in California employs 980 parabolic trough collectors, each 47 m long. In order to achieve the highest efficiency, the solar troughs should track the sun across the sky. If the solar troughs are aligned north-south, a system that tilts the troughs about their long axes can be used to follow the sun from east to west. This is the arrangement which has been used in existing solar trough power plants. Once sunlight has been concentrated it must be captured and converted into a form of energy that can be used to generate electricity. The simplest way of achieving this is to place a tube containing a heat absorbing liquid at the focus of the parabolic trough. The liquid is pumped through the tube, absorbing heat as it passes and this heat is used to provide energy to drive a heat engine. The small number of commercial solar trough power plants in operation all use a heat absorbing oil as the heat collection and transfer medium. This is pumped through the absorber tubes in the solar troughs, where it eventually reaches close to 400°C. The hot oil is then pumped through a heat exchanger where it is used to heat water and raise steam in a secondary system. 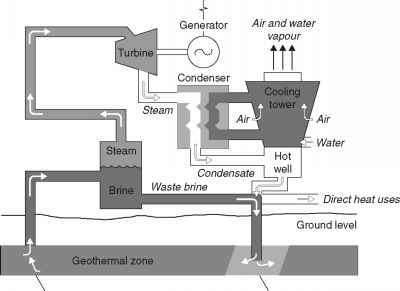 The steam drives a steam turbine which generates power. Commercial experience with parabolic trough solar power is based on nine plants in California built from the end of the 1980s with capacities ranging from 3.8 to 80 MW. These plants employed a secondary firing system utilising natural gas so that output could be maintained when solar input was low. 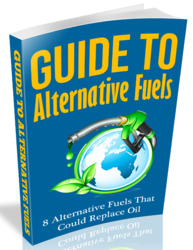 In total the fossil fuel input could provide up to 25% of the plant output. In 2000, these plants achieved a peak solar-to-electric energy conversion efficiency of 23% and an annual efficiency of 15%. in today's deregulated electricity market. However new designs are expected to become competitive. Research suggests that costs can be reduced significantly if new reflector fabrication and mounting methods are developed. Another significant cost reduction can be achieved by dispensing with the intermediate heat transfer oil used in existing plants and heating water directly to generate steam. Some form of heat storage system will improve flexibility and economics by allowing solar plants to generate power at night. Another approach is to build on the idea of a combination of solar and fossil fuel energy by developing sophisticated hybrid power plants. The most attractive scheme involves building a parabolic trough collector array adjacent to a combined cycle power plant and using the heat collected by the solar array to supplement the heat from the gas turbine exhaust of the combined cycle plant. 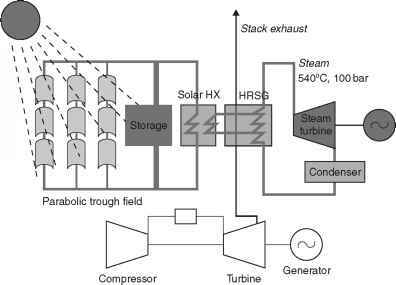 Both the gas turbine exhaust heat and the solar heat are then used to raise steam and drive a steam turbine. This arrangement, called an integrated-solar combined cycle (ISCC) plant, makes good use of solar energy when it is available but is not reliant on the sun. Incorporating solar collection into a conventional fossil fuel power plant reduces the cost of the solar energy system significantly and this approach has attracted the support of the World Bank's Global Environment Facility. Such plants might involve a solar generating capacity of 30-40 MW out of a total of 140-300MW. While the ISCC plant still relies primarily on fossil fuel, it does represent an economical way of introducing significant solar capacity.